Lisa Ashton MBE and the Winnie Mabaso Foundation team came to Cosmic in need of a new, refreshing website for Ilamula House, as they did not currently have a website dedicated to the cause. 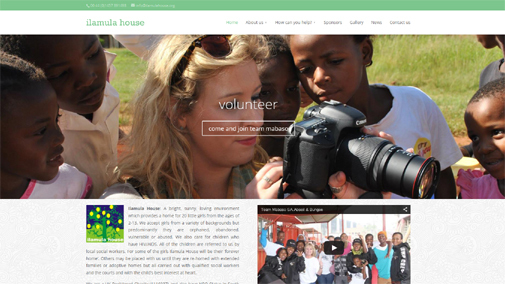 Ilamula House required a simple yet effective website to showcase the great work the team have been doing – this includes profiles of staff, trustees, patrons and ambassadors, as well as information on how you can help, the ability to donate via Virgin Giving, latest news and an extensive photo gallery using the wonderful photography supplied by Lisa. Cosmic created a light themed responsive CMS website made in the popular CMS platform ‘WordPress. The website is designed to work perfectly with both computers and mobile devices for maximum impact. Who are The Winnie Mabaso Foundation? “The Winnie Mabaso Foundation began in 2004 – supporting vulnerable and orphaned children in South Africa. You can take a look at the Ilamula House website at www.ilamulahouse.org.